Today was one of the busier days in distressed debt investing for 2012 with an eye-popping bid for Hawker's assets and rumors all day of a Patriot bankruptcy filing which was definitively announced after the close. Tomorrow I will do a post on Hawker and the Superior bid and what it means for recovery, but tonight's post with focus on Patriot Coal's bankruptcy filing. 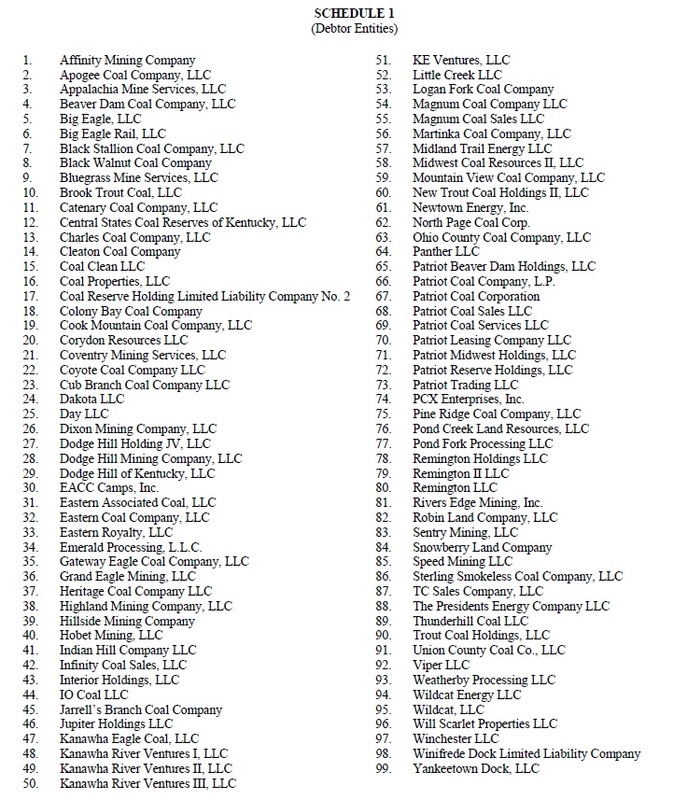 I first wrote about Patriot Coal a few weeks ago: "Hot Topics in Distressed: Coal Names"
The Patriot Coal claims agent site can be found here: Patriot Coal Claims Agent. $802M DIP coming with proceeds used to "refinance certain of the Company's obligations under the existing credit facility and the existing securitization facility, and for working capital, capital expenditures and other general corporate purposes"
For readers reference, the guaranteed bonds (8.25% of '18) went out 33.5-34.5, flat. The converts were last quoted at 7.5-9.5, though I saw a buyer at the very end of the day at DB bidding 7. The guaranteed and converts started the day at 41-43 and 31-33, respectively. Editor Side Note: Last week PCX's equity was up nearly 100%. I had asked around what the hell was going on. I had heard there were multiple buy-ins before the holiday, accelerating when markets opened on Thursday. Bonds during that time really weren't doing much. Interesting details on their benefit plans: 10,286 primary insureds and 12, 145 beneficiaries for a total of 22,431 individuals covered under the benefit plan. Compare this to an active work of nearly 4,500. On Petition Date: $300M LOCs, and $25M direct borrowings under their $427.5M Revolver. $51.8M LOCs against the $125M AR facility. Declaration goes on to blame legacy liabilities for one of the reasons for the restructuring; specifically the fact that 42% of PCX's employees are represented by the UMWA (vs 11.4% of the industry) and that brings about restrictions to the the National Bituminous Coal Wage Agreements of 2011. 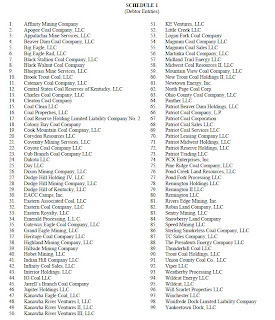 PV of Coal Act liabilities at $140M. Black lung liabilities of $186M looking to go higher due to Obama-Care but these could be put to BTU. $73M in workers comp liabilities. The BTU disclosure is somewhat confusing. Anyone have color on this? Who is on the hook? DIP Terms: $125M 'First Out' DIP ABL and Term Loan. 'Second Out' DIP of $302M which will roll existing Letters of Credit under the existing Revolver. New money / liquidity will be approximately $425M which I believe is slightly higher than the market was anticipating. Debtor is forecasting a $27M cash inflow for the 30 days following the petition date. Depending on how bulled up you are on coal, comps trade anywhere from 4.5x-7.0x 2013E EBITDA. The problem of course with Patriot is that as of today's filing (that I can see) we do not have a good handle on the size of the unsecured claims pool due to lack of clarity on vested vs. unvested post-retirement liabilities (vested can be rejected and therefore establish a claim in bankruptcy). The asset side can be broken down per mine (whether it be thermal / met, leased or owned, CO2 content, etc). It remains to be seen if any of the domestic majors are willing to add capacity in the CAPP; though that's not to say you may not see foreign entities or even steel players come in looking to add some vertical integration (though PCX's vol-B coal is not in high demand today). I have to think given the size of the DIP, and absent large asset sales for cash generation, the guaranteed bonds will need to step up for some sort of rights offering to keep leverage at manageable levels on an exit. Is there any sort of litigation strategy for the converts against the syndicate that was leading the term loan syndication a month ago or even against BTU for the spin (hail mary?). Depending on how juicy / tight the terms of the DIP are, it could be interesting. With no real way to hedge the unsecured guaranteed bonds, there doesn't seem like a lot to do until more information comes out. Will will keep readers updated to our valuation work and would welcome any thoughts if you are working through this bankruptcy as well.